Click here to download Constant Info Pro. Version 1.57 (12/23/17) – A lot more testing and tweaking since version 1.52. Version 1.51 (11/17/17) Fixed: An issue with some repeating items showing as blank. Tweaked file saving. Version 1.50 – Added un-hiding of the scroll window and items whenever a computer comes out of Sleep or Hibernation. Version 1.48 adds Advanced Notification of dated items and Weekly repeats. After extracting the Constant Info Pro program from the Zip file, just double click it to run. After completing the first release of Constant WORD, I kept thinking there was some other uses for displaying text in a banner (ticker) format. At work, we use a program to track our tasks and it categorizes tickets by severity or importance and by location. We frequently get emails related to big issues going on or for upcoming changes. I felt the banner format could be used as an early notification system for teams or work groups. Using severity codes 0 to 5 the program can display important items (issues) and let users know how quickly they need to be addressed or how widespread they are. 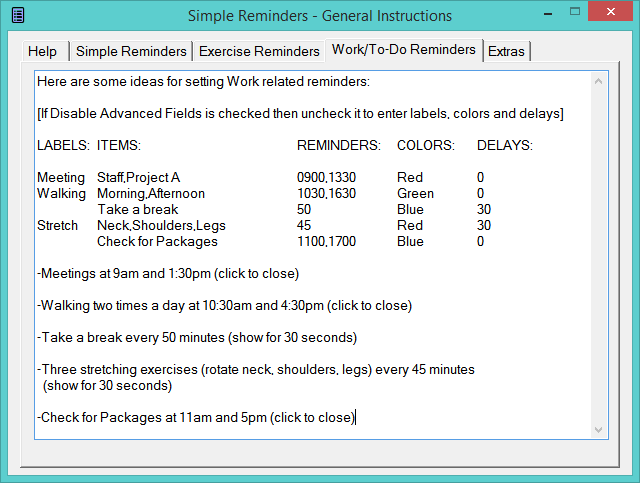 Item Description – enter a short description of the reminder, task or issue. This text is what displays in the scroll window. 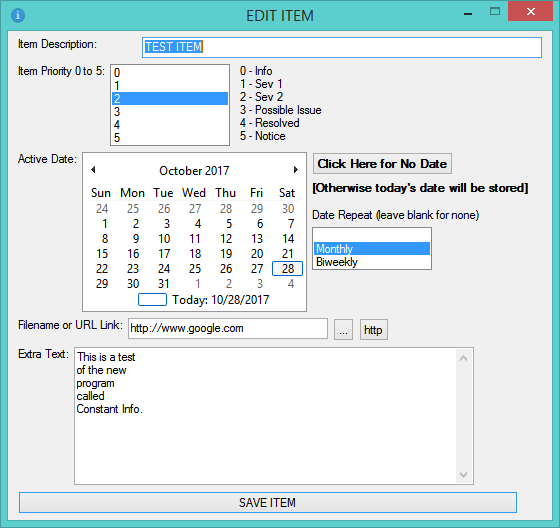 Item Date – (displays on a specific date unless Repeats are used) which can also be left blank in order to continue showing the item until it is deleted. Item Repeat – (blank, Monthly, Biweekly or Weekly). Monthly displays the item on the same day of each month until changed. Biweekly displays the item if today’s date is a multiple of two weeks from the stored date. 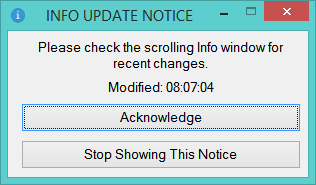 Use Advance Notices from the menu to see items 1 to 7 days ahead of time. Item Link – Users can click on the three dots button (…) and then select a file or click on “HTTP” to have the program enter http:// into the link field. Copy/Paste any desired web link into the edit box. When items are being displayed, they will be surrounded with asterisks if a link is present (i.e. *This is a test*). Users can right-click the item and choose Open Link or hold down the CTRL key then double-click the item to open the linked file or web page. Item Priority – Choose a number from 0 to 5 to prioritize the item. This number determines what color the item is displayed with. Item Extra Text – A much longer section of text detailing each item can be entered into this field. Items containing extra text are surrounded with brackets (i.e. [this is a test]). Right clicking on the item and choosing “Show Extra Text” will display the text in a separate window. When items are added, the program also adds the current user name. This is only for display and isn’t changeable. It serves as an audit trail for team users of this program. However, it will be deleted when the item is deleted. Perhaps in the future a regular audit log will be kept separately. 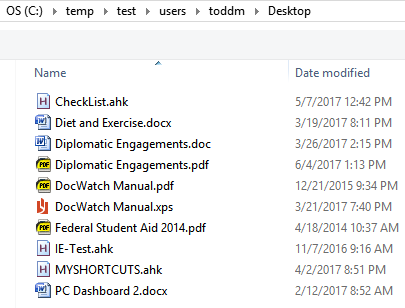 When the program is first run, it will prompt for the folder you want to save the Info file into. The file is called ConstantInfoPro.txt. If an item has a Link or Extra Text, the popup window will note it. Right clicking on the window will display a small menu that is appropriate for the item. 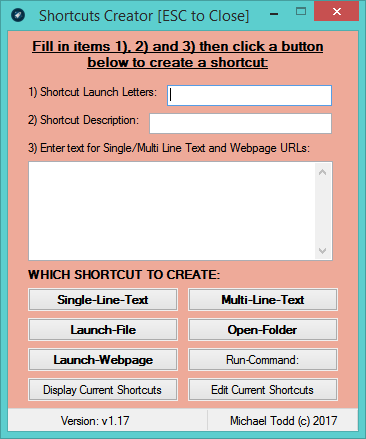 In this case, you can choose “Open Link” to display a local text file, if desired. You can always right click and Add new items and Edit all items. Right click the window and choose “Add new Item” or use the menu option to add new items. *IMPORTANT* – By using a calendar control to enter a date, remember that it will automatically insert today’s date UNLESS you click on the “Click Here for No Date” button. This will make sure the date is blank. 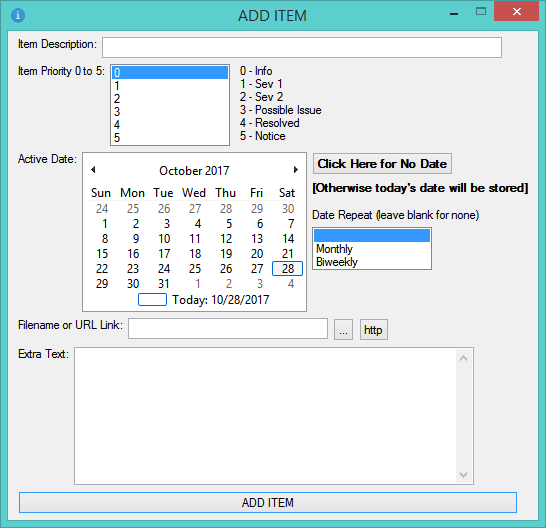 If you want an item to only appear for a day then make sure the Date Repeat is blank. If you want to see an item the same day of every month then choose Monthly. If you want to see an item every other week on the same weekday then choose Biweekly. For the scrolling window, you can change its Width, Location, Font Size, Font Style (Normal or Bold), add a Border, have the window Fade after 30 seconds so you can see underneath it (pointing to it will remove the fade) and change the scrolling speed. You can also hide or show the window by clicking on the program’s taskbar icon. The Ins, Delete, Home, End, Page Up and Page Down keys can be used to quickly move the window into 6 areas. Just click on the window first then press a key. If you have multiple monitors, mouse over the window, hold down the Shift key then drag the window to any screen you desire. All of these items are in the right click menu. The all on One Line option is just an experiment. It shows items separated with vertical bars and flashes the appropriate color for each item. If you are using the program with other users on a network, you will see this window whenever they make changes. Sometimes you will see it also after Adding or Editing items. If this is too intrusive then click the Stop Showing button. 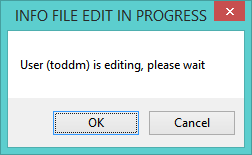 If you try to Add or Edit items when someone else already is then you will see this message. You can wait a little while or click cancel and try again later. The easiest way to learn the program is to edit the demo items and see the results. Whenever there are no items or no dated items that match then the scrolling window will disappear. 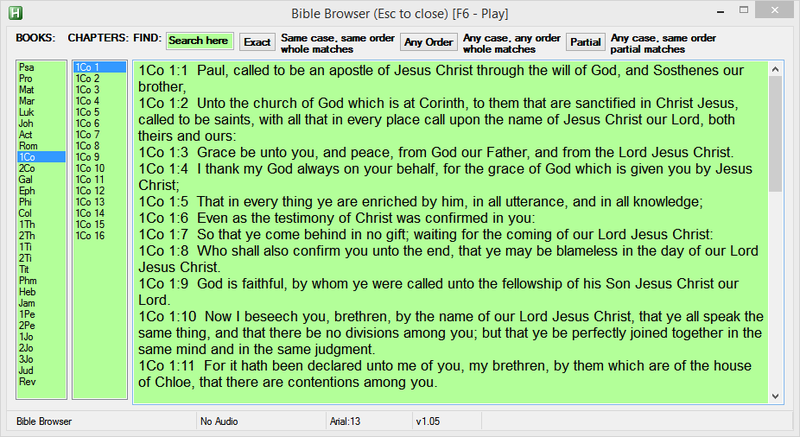 [Version 1.41 (11/10/17) add two menu options, Set Favorite Verses and Show Favorite Verses. 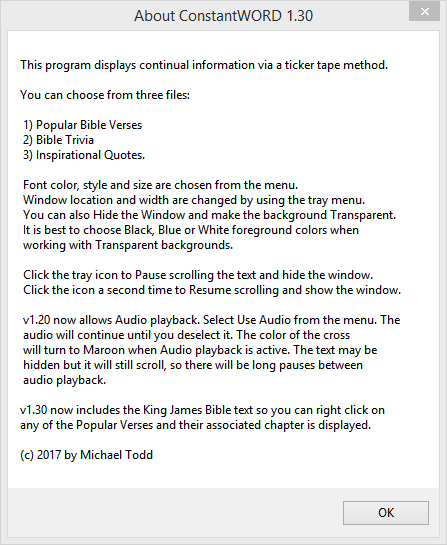 Set Verses displays a Bible verse window from which you can navigate to any verse, click on any displayed verses and Add Verses to a memorize list. Enter Display Times like 0900,1300 for 9am and 1pm and those verses are displayed then. 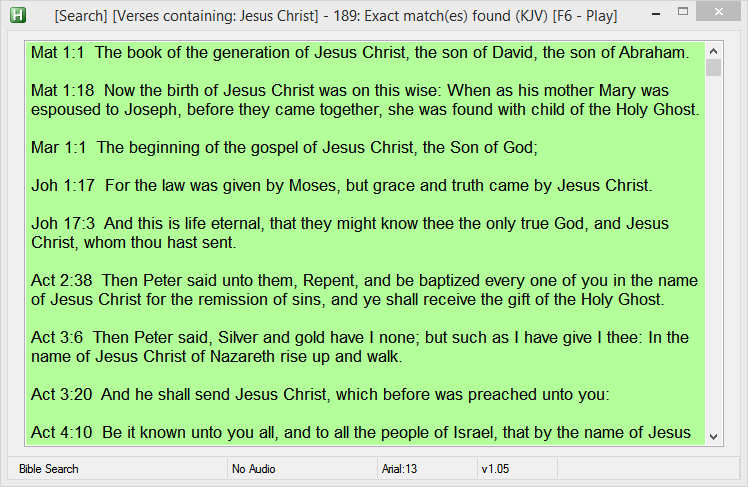 Lately, I have been trying to think of what other ways Biblical information can be presented on a Windows PC. I have both Ready Bible Study which allows for full audio reading from any resource and a smaller Bible Promises application. 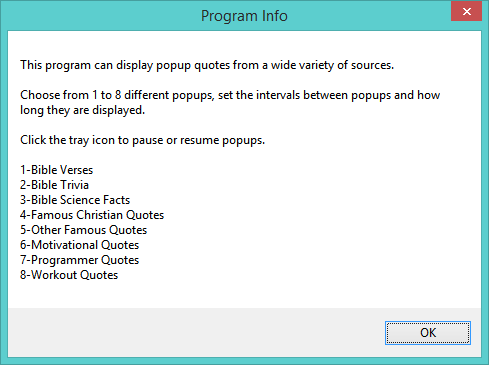 Popup Bible verses and Christian quotes can be displayed with Ready Bible Study or another program called Popup Info. 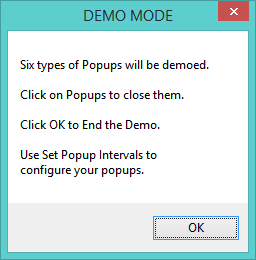 These popups are small windows displayed at user set time intervals. 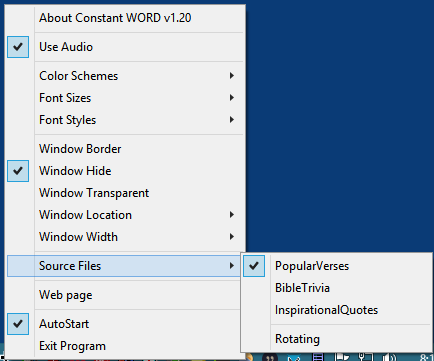 Using three source texts that are part of my other Bible programs, I created a new application called Constant WORD. Operation of the program is very simple. 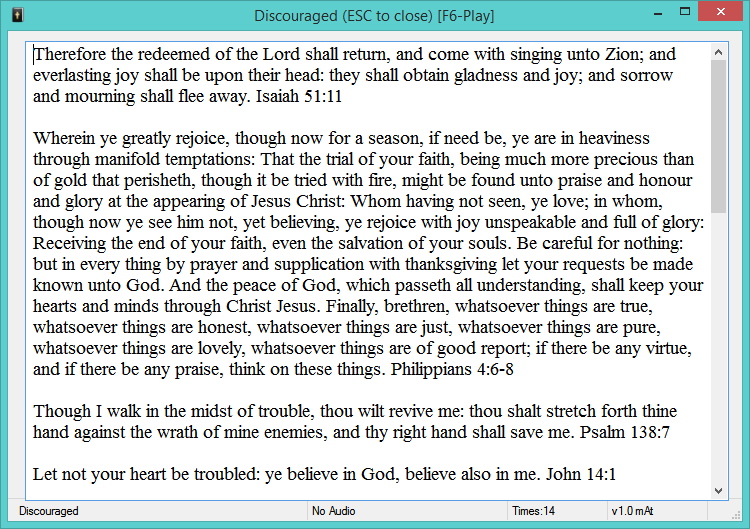 When you first run it, you will see a randomly chosen Bible verse from among 523 popular verses in a small window at the top middle of your monitor. The text will scroll slowly and once it disappears the program will choose another verse. 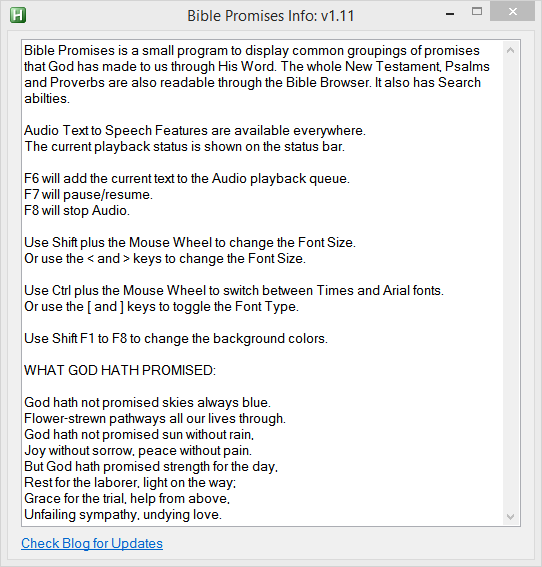 When you put your mouse over the window, it will pause and display the Book Chapter and Verse that is currently scrolling. The program run continuously until you shutdown or exit it. When you click on the window then press one of the keys (Ins, Del, Home, End, PgUp, PgDn), the window will move. 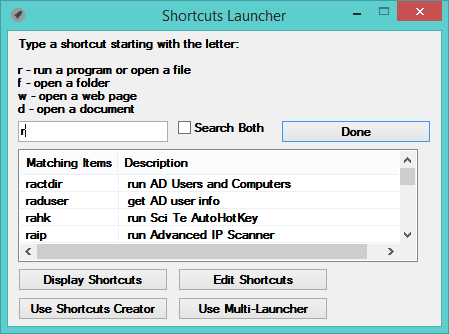 You can also use the program’s right-click menu to set the window location. 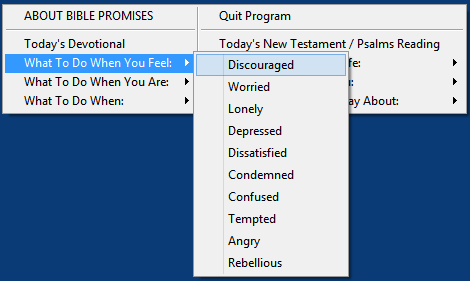 The program is quite configurable using its right-click menu. For text font, you may select Normal or Bold style, sizes 8 to 12 points and the width of the window in pixels from 400 to 600. For colors, you can select from several color schemes. The first color is text, the second color is the window background. For the window you can turn its border on and off, select its location and its width. In order to change the source text, simply pick another one from the menu. 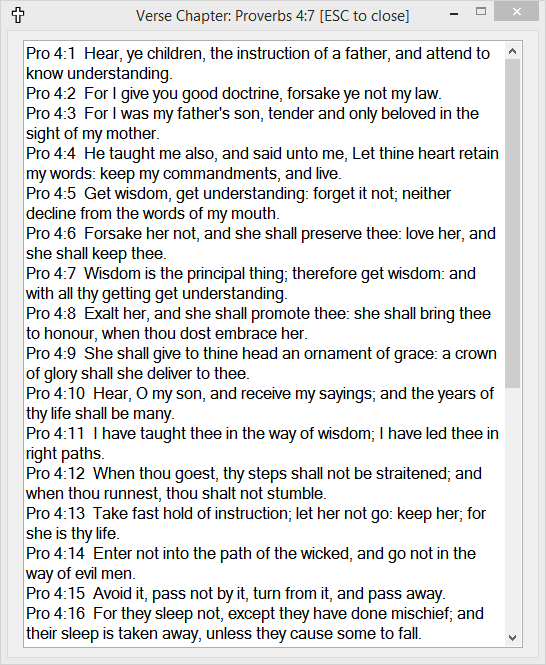 The program saves all settings but border and source text which default to None and Popular Verses (since the name is Constant WORD). Clicking on the program’s tray icon which is a white Cross will pause the scrolling until you click it again. The cross color will change to denote it is paused. New in release 1.08 are a couple more Colors and clicking on the tray icon and the menu item Window Hide do the same thing now. Clicking the icon now pauses the scrolling and hides the window. The program will also stop scrolling if the mouse or keyboard has not been used for 30 seconds. Some screen shots from the program are below. I look forward to any feedback or suggestions you may have. Right click a verse to display its chapter. 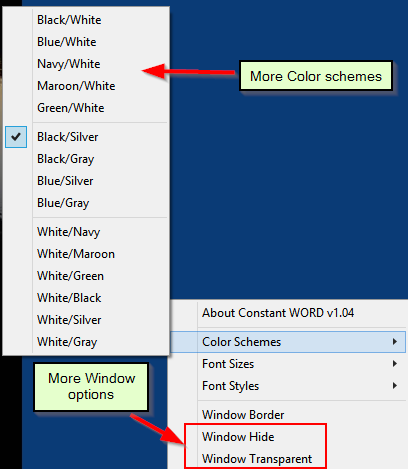 New in release 1.04 are additional Color Schemes, Window Hide, Window Transparent and automatic Rotating between the three source files. 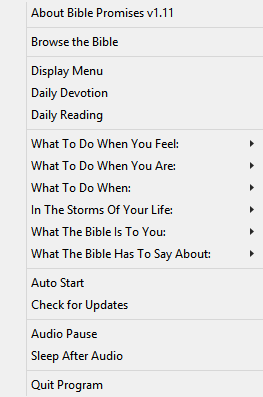 In the above picture, if you click on Rotating, the program will switch to the file 2 Bible Trivia for 10 minutes then switch to file 3 Inspirational Quotes for 10 minutes then go back to file 1 Popular Verses. It will continue to do this until you exit or uncheck Rotating. Clicking on Window Hide will pause Scrolling then Hide the window until you choose it again. It’s kind of like pressing the Boss Key from the past. Clicking on Window Transparent will make the current background color transparent. This works well to blend the text into either the Title bar, the status bar or the windows desktop. You will have to experiment with this feature. If the text becomes hard to read then click on Transparent again to turn it off. Below are two windows showing regular gray background and transparent background. 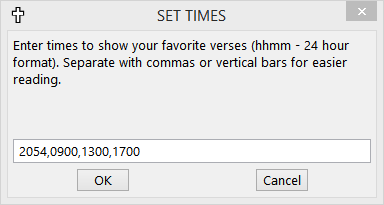 Selecting Set Favorite Verses will show the verse chooser. 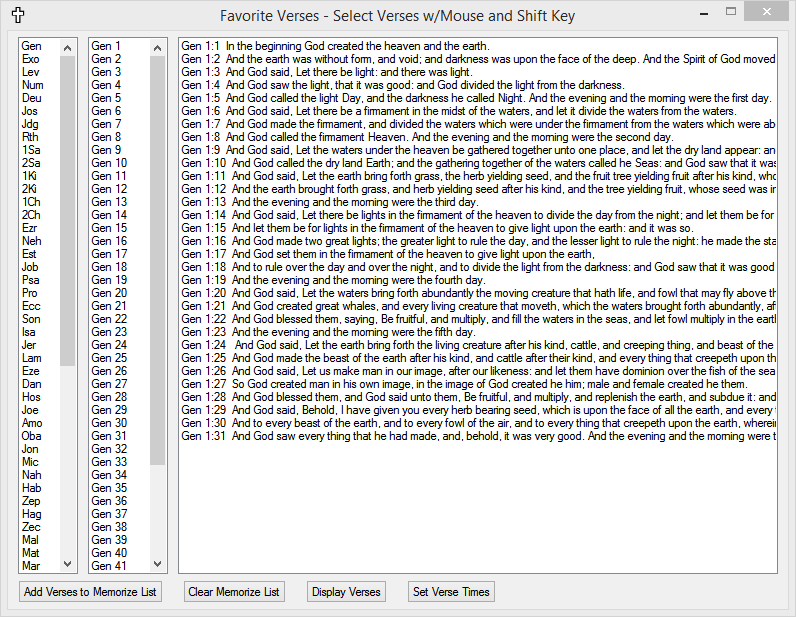 Select one or more verses with your mouse then click Add Verses to Memorize List button. Continue to do this until you are done. You can click Display Verses to see the result. Click Set Times to enter a list of times you wish to see your chosen verses. Just use 24 hour time and leading zeros from midnight to 10am. I will also look at add other resources in the future. 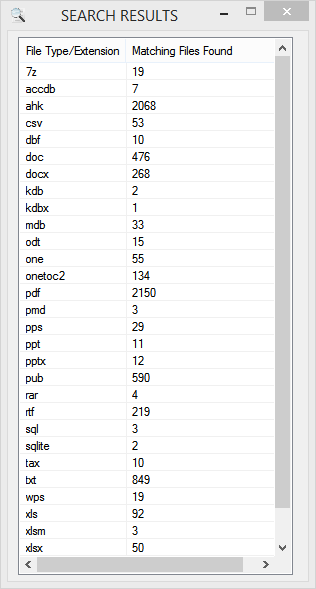 This release contains close to 2,500 items between the three source files. 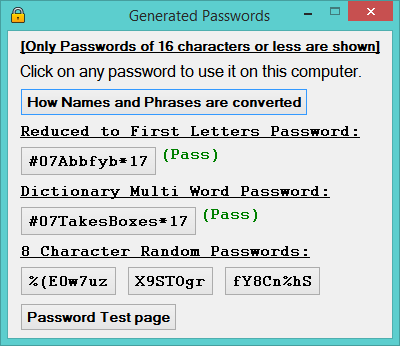 Password Helper runs standalone and uses two lists of embedded phrases and one small words dictionary file to generate up to 4 different passwords. 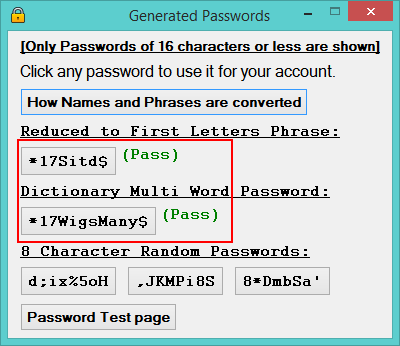 Enter your own phrase or use one from the two supplied lists then click on Generate to see the passwords. Three random passwords are also shown for those who like to use those (i.e. Nerds). 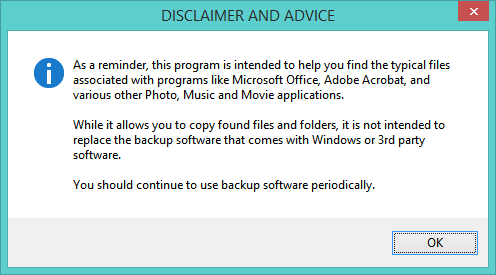 On home PCs and others not on a corporate network, you will see this prompt when starting the program. The only way the program can change the password for you after you have chosen one is to have Administrative privileges. You do not have to enable this as you can always write down any suggested password then press Control Alt Delete and choose Change Password to set a new one. After making your choice the main screen appears. There will be an asterisk (*) in the Status bar when the program is running as an Admin. 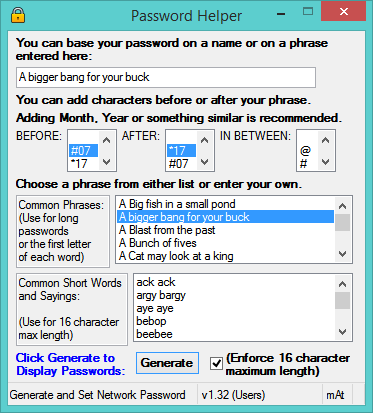 The password #07Abbfybbased on the first letters of the phrase “A bigger bang for your buck” is shown with extra Prefix and Postfix additions. By default, the current Month is part of the Prefix and the current year of part of the Postfix. And the # and the * are added front and back. Together this makes a password of 14 to 16 characters, but, you only have to remember the phrase to figure out the letters. The second password is based on two random words chosen from a list of 7,000 common words. The words are either 4 or 5 letters long. If the “Enforce 16 characters” isn’t checked then the words will be up to 6 letters in length. Slang terms were removed but some funny combination show up nevertheless. Remembering an easy phrase or two easy words is about as much help as you can get to create a reasonably strong password. If you uncheck the “Enforce 16 characters” password length then click Generate again you will see more password suggestions starting with the original phrase without spaces. After some password testing I have found out that the three longer passwords are about equal in strength. The first one is far easier to remember. Using longer than 16 characters is purely up to what your computer(s) or websites are able to handle. When you click on any password button you will be prompted three times. 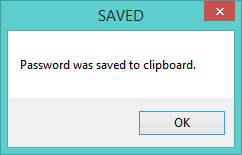 The password will be copied to the clipboard first. The second prompt is to save the password. The third is the “Are you sure?” prompt. If you didn’t start with Admin privileges on a home PC then you will see this prompt. You are still allowed to restart as an Admin now, but, if you like that clicked on password remember to write it down now because it won’t be saved. You can also click No below then use Ctrl-Alt-Del to change the password. This will restart with Admin privileges. It is much easier to do this when first starting the program. *IMPORTANT* If you are on an office network then this step is not necessary as the password will be changed with a small program called setpassword. 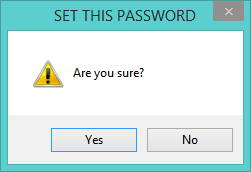 The program will prompt you for your current password and then change your network account password to the new one. There are a lot of phrases supplied that work with the first letter password scheme and there is a smaller list that works within the 16 character limit. Clicking Generate repeatedly will always create more Two Word passwords and more 8 character random passwords. Just click until you find one that you can easily remember. You can also changed the Prefix and the Postfix characters and choose an interleaving character if you desire. I hope this helps many of you to start using stronger passwords with your computers and websites. 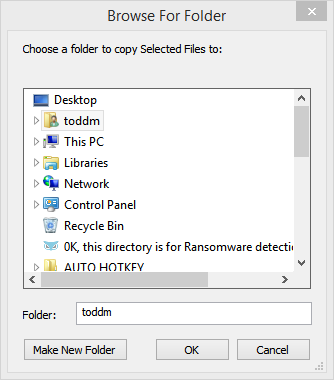 For users who wonder were some of the files may have gotten off to, this utility will search for common file types in either the user’s profile folders (drive C) or anywhere on other fixed or removable drives. 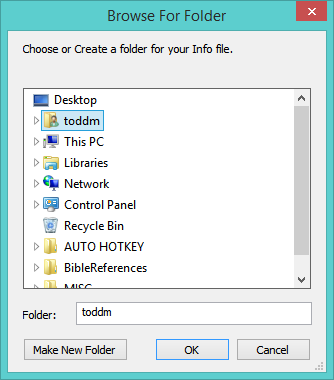 Once you choose the drive and the areas to search, the program quickly finds matches based on the chosen file types. 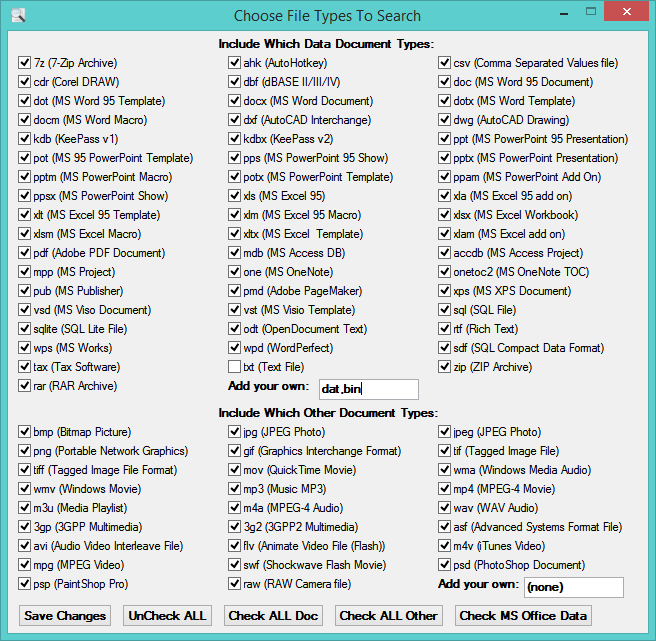 You may right click and copy selected files or the matching files from selected folders to any other media. Here are some screenshots. And here is the program for anyone who is interested. 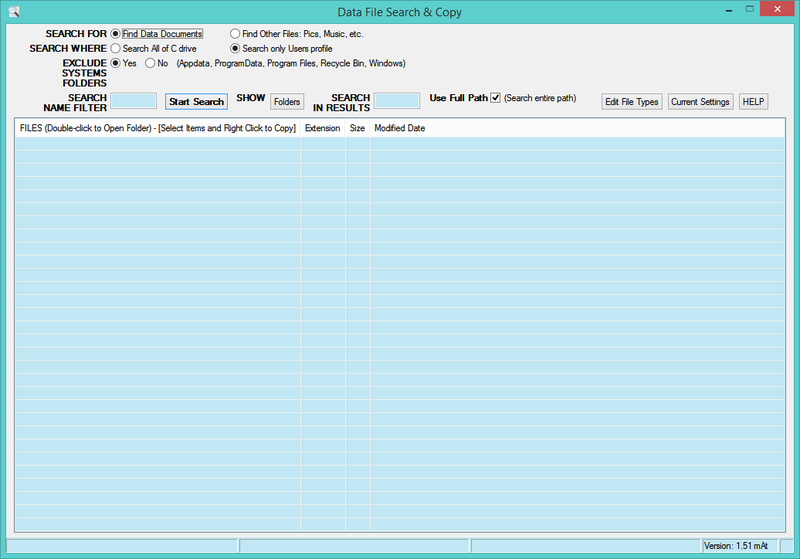 Data File Search and Copy Just drag the file out of the ZIP file and run from anywhere. You can choose from any fixed or removable drive to Search. Tool tips appear when hovering over each item. 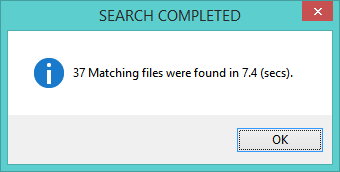 Searching on files named list finds 37 matches. 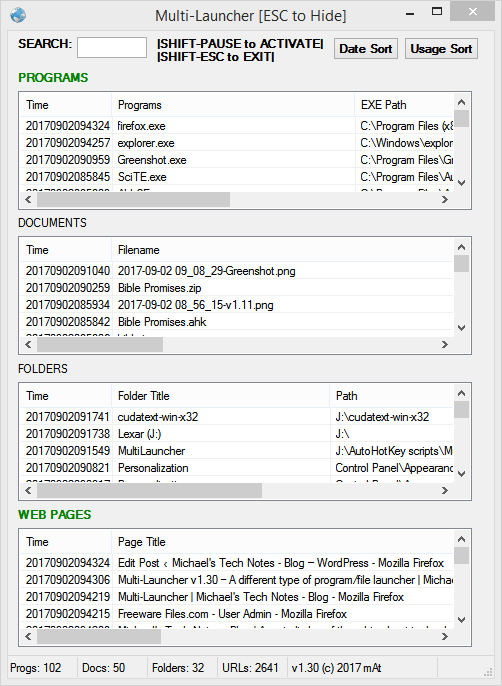 A summary by file types is also shown. 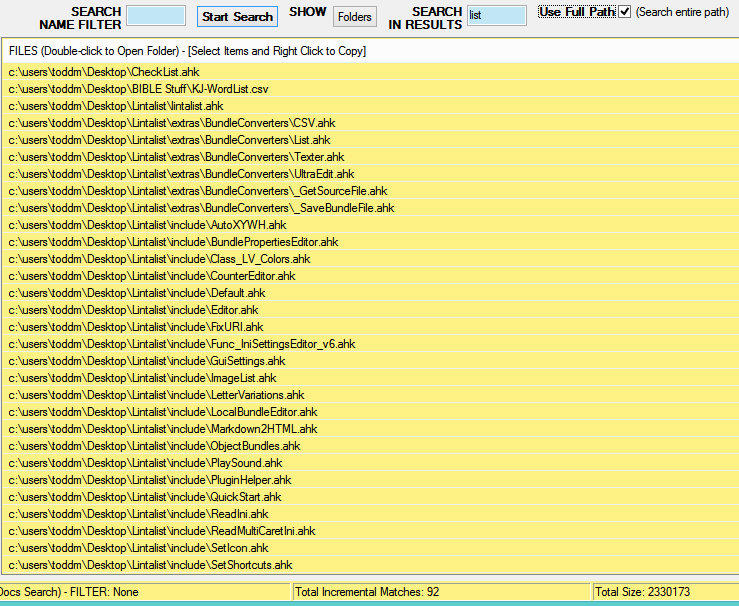 Finding all Office type documents finds over 4,000 files. There are 11 on my desktop folder. 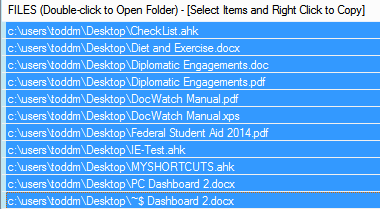 Eleven files are also shown when I click on the Folders button to summarize by folders. 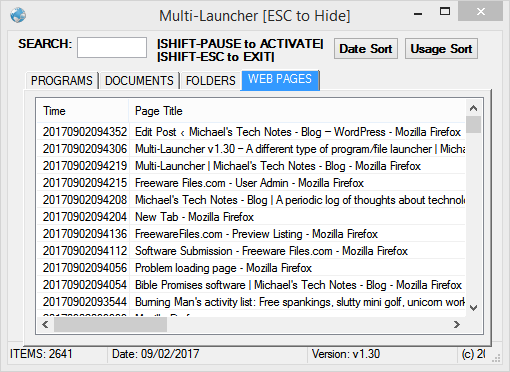 Right-clicking allows files or folders to be copied. If you wish to search on all files first then you can still find those with list as part of the path name by using the Search in Results field. 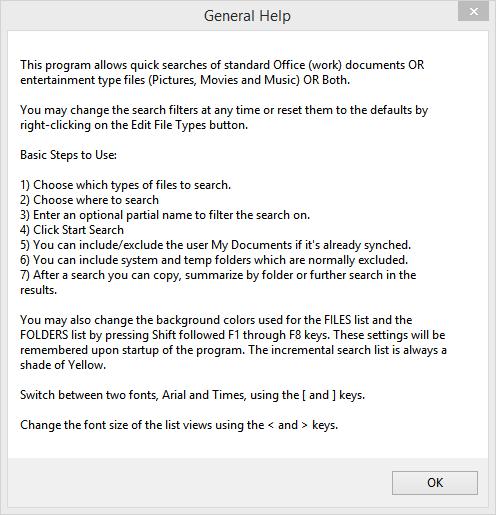 You may modify the search file types by click on Create Settings File or Edit Types. 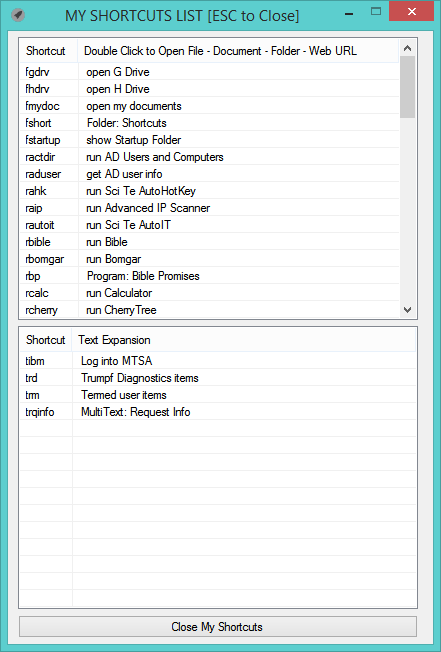 The program has preset files to search to spare you the trouble to figure them out. 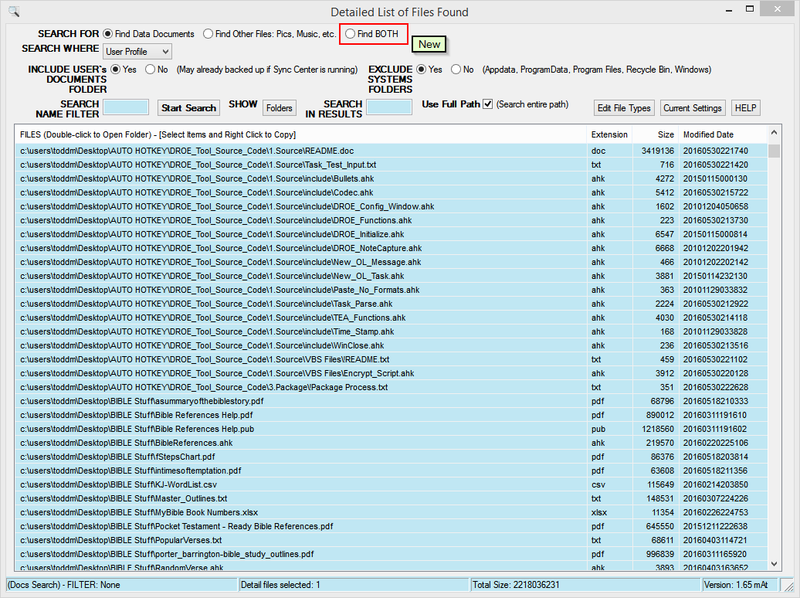 Choosing to Edit File Types displays a laundry list of common file types. You can check / uncheck as desired. Use UnCheck/Check All buttons to speed up the process. 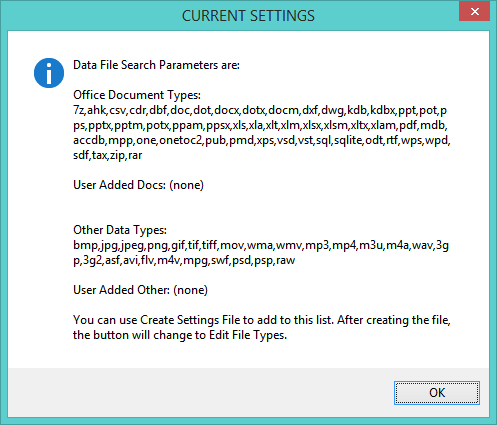 Clicking ‘Check MS Office Data’ will deselect all data document types but the ones with MS (Microsoft) as part of their description. This makes it easy because there are so many. Be sure to click ‘Save Changes’ when you are finished or the Red X for no changes. 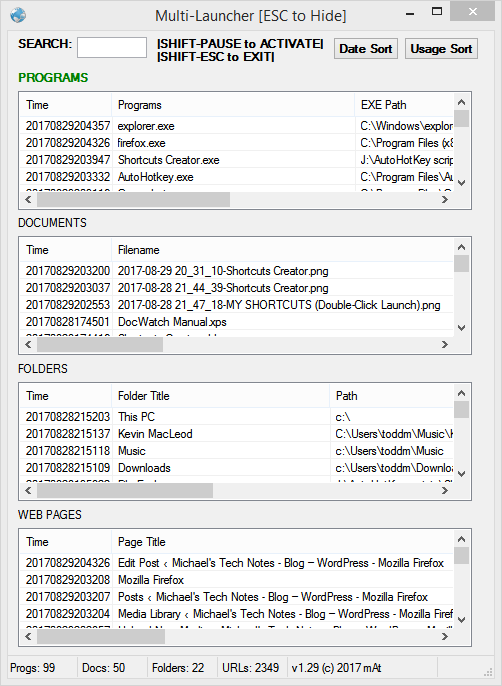 [New – you can ‘add your own’ file types to either section now. Just make sure to separate the type entries with commas. If ‘add your own’ is blank then once you click Save, it will be displayed as (none) afterwards. You may also change the background color, the font name and the font size for the lists. 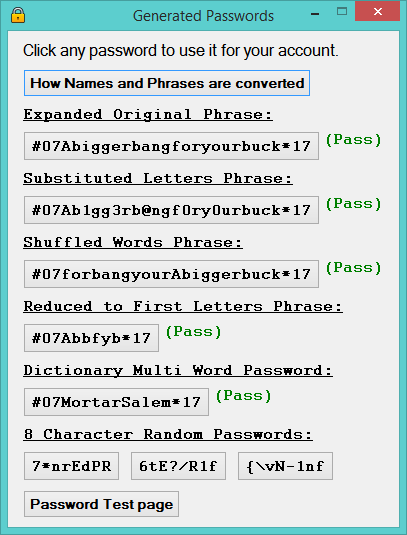 After recently spending time creating an application to take words or phrases and turning them into password suggestions, I thought I would share. Long passwords are in general more secure than short ones. However, it all depends on the composition of a long password. It is much easier to remember a long phrase than a short, random password. It turns out that most computer users have been taught to use passwords that are hard for them to remember. But, those types of passwords are actually easier for programs to figure out. So, why bother with random passwords at all? What we find, is that the first and fourth passwords are the strongest and are easy to remember. Using a password strength tool like zxcvbn, the results are below. 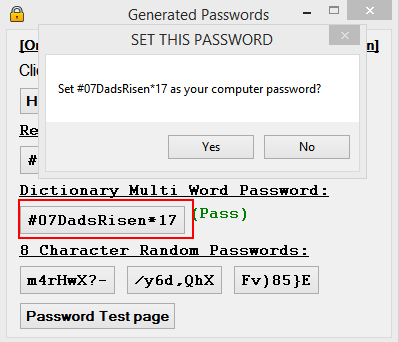 This tester checks the characters in the password and also looks up words in a large dictionary. In the first example, a computer would have to check up to 1,000,000,000,000 (10^12) different guesses to find the correct phrase. You can see a direct relationship between the length of the password and how hard it is to guess. Microsoft limits passwords from 8 to 16 characters. Yahoo use to allow really long passwords but now 32 characters is the maximum. So, the recommendation is to use a phrase you can remember easily, but, not one that others would know about. For Microsoft logins or emails, you will have that 16 character limitation but you can use a long phrase and just pick the first letter of each word, then add text to both ends of the result. If you use something like month and year above then your phrase can be up to 10 words long. Be sure to include upper and lower case words. For more information on zxcvbn which was created by a programmer at DropBox, click here. For another password test page, click here. v1.03 update. 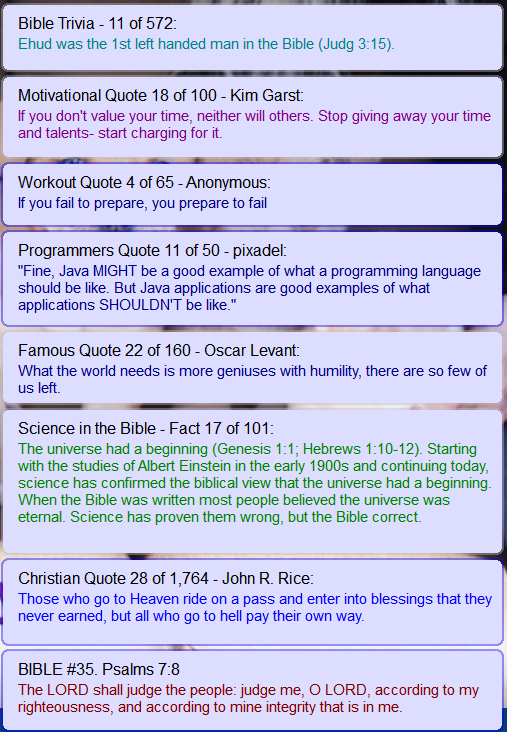 Corrected the number of Christian Quotes to 1,750.
v1.02 update. 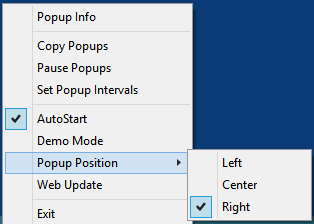 Adds menu options to display popups on left or right side or the center of the main monitor window. First Public Release v1.0 is now available. 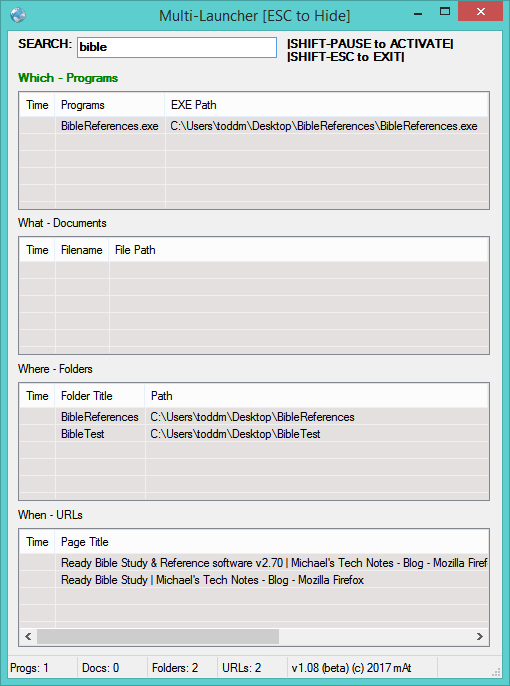 Over a year ago, I added some popup information to my Ready Bible Study program. It took some time to get the lists together and learn how to present them in a simple, attractive way. Late last week I decided that I would split off those lists, add some more and create a separate, much smaller program called Popup Info. I added a list of 160 general quotes, 100 motivational quotes, 50 computer programmer quotes and 65 workout quotes which makes a total of 8 different lists. As I run across more, I will add them in the future. Users can set the number of minutes between popups and also turn off any lists they are not interested in. Setting any Interval to 0 will turn that list off. 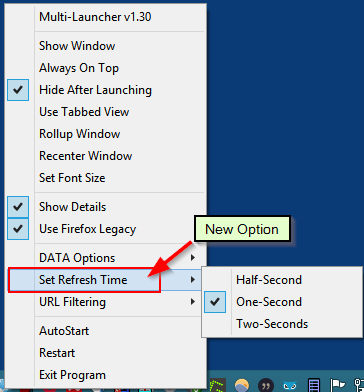 Setting the Display Time to 0 will display each popup until you click on it. 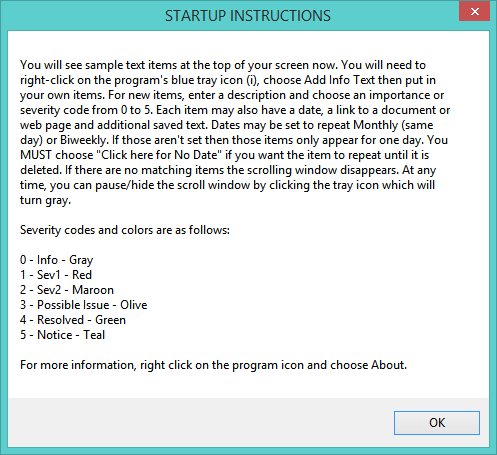 You may click on the program tray icon to Pause or Resume display of Popups. As usual there is no installer required, just open the zip file and copy the Simple Reminders to any folder or to the desktop and run it. If Windows prompts to run, just click Run anyway. In 2017 there have been a lot of articles detailing why sitting for long periods of time is very bad for one’s health. 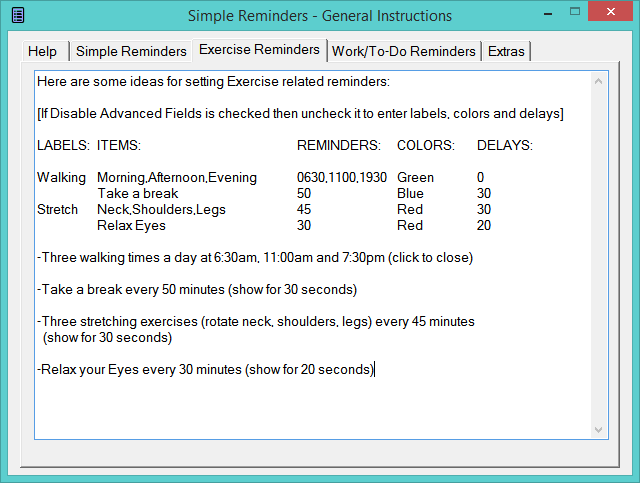 Having written a program call Get Exercise last year, I thought perhaps a smaller, more generic Reminder program may get even more use. Get Exercise has had about 2,000 downloads and has a lot of options, lots of pictures / diagrams for stretching and eye exercises, but, it may be overwhelming for some users. 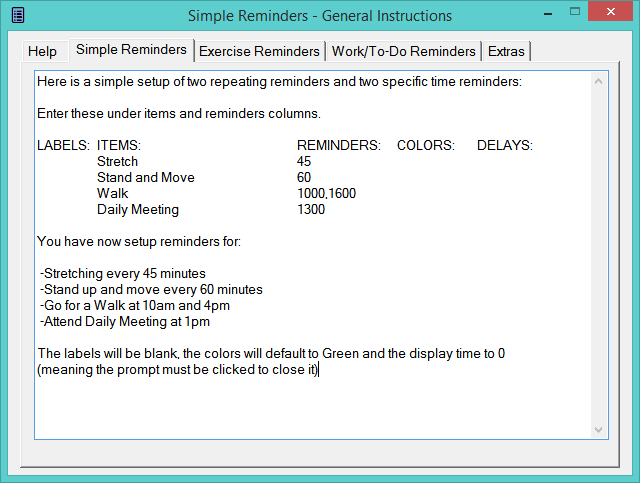 A smaller program that can still reminder computer users to get up, walk, stretch, take out the trash, attend a 10am phone meeting, etc. will hopefully be easier for everyone. For those who want more bells and whistles, the other program will remain available. 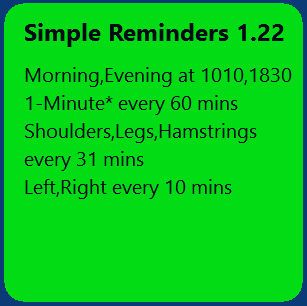 The About Simple Reminder window has general info plus several examples of ways to setup reminders. There are a couple of extra features borrowed from Get Exercise which has its blog page here. The initial Reminders are set as follows. 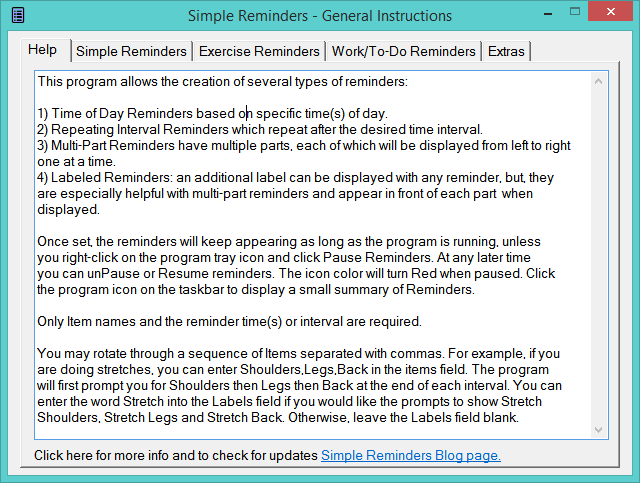 Clicking on the program’s icon in the system icon area of the Task bar will display a mini list of the currently set reminders. 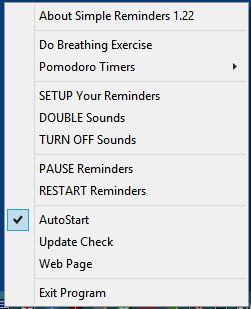 Pausing Reminders from the menu will stop notifications from appearing, but, doesn’t stop the timers from running. 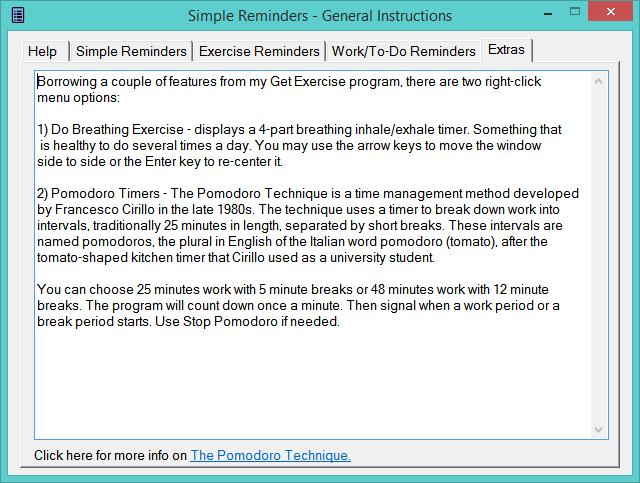 For more info on ‘Do Breathing Exercise’ and ‘Pomodoro Timers’ refer to the page on Get Exercise. If you want more sound when a reminder is displayed then check ‘DOUBLE Sounds.’ Or you can TURN OFF all sounds.